The MRX515 is high-power, lightweight two-way loudspeaker system offering a very high level of performance from a speaker that can be placed on a pole or standard speaker tripod stand. The MRX515 is comprised of a 380 mm (15 in) 265H Differential Drive® woofer which handles 400 watts (continuous) yet the entire system weighs only 19.5 kg (43 lbs). For the high frequencies, the 2408H 37.5 mm (1.5 in) annular polymer diaphragm, neodymium compression driver is mounted to a 70° x 70° horn. For use on a tripod or over a subwoofer, JBL’s dual angle pole mount is included. This feature allows the speaker to be mounted in a vertical position or with a 10° down tilt for optimum audience coverage. 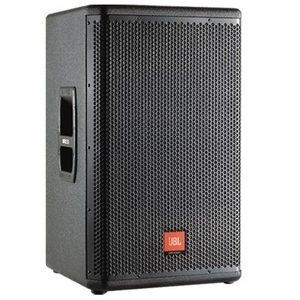 The enclosure is constructed of quality plywood and coated in JBL’s rugged DuraFlex™ finish. The attractive CNC-machined, 16-gauge steel grille wraps around the sides of the enclosure. The grilles are internally lined with an acoustically transparent screen to provide additional driver protection and give a very professional appearance.